To Sum It Up: Sorry-in-the-Vale may seem like a sleepy little English town, but in fact it hides some very dark secrets. Its fortunes appear to rise and fall with those of its founding family, the Lynburns, the last of whom left for America seventeen years ago. Now they’ve returned, and Sorry-in-the-Vale resident Kami Glass wants to find out why. Kami has a story of her own that she keeps to herself—her best friend is Jared, the voice in her head that has been with her all of her life. The last thing Kami expects is for Jared to be a real person who shows up in Sorry-in-the-Vale, but that is precisely what happens. Review: If I could personify my sense of humor in the form of a book, it would be this one. I’ve never encountered a book that so perfectly matched my notion of what’s funny. 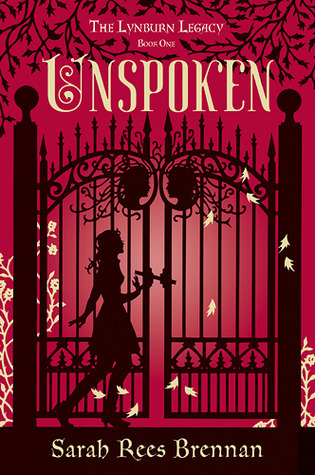 I had to put Unspoken down several times because I was laughing too hard to continue reading, and out loud at that. And believe me, books don’t make me laugh out loud too often. So what, exactly, did I find so amusing about this book? The characters, particularly our protagonist, Kami, are just unbelievably witty. The dialogue in the novel crackles with an easy levity that doesn’t feel labored. Of course, what constitutes comedy varies from person to person, and not everyone may think Unspoken is as riotous as I did. But for me, reading this was like meeting a kindred spirit. Although it was the humor in Unspoken that bowled me over the most, not every aspect of the novel is about laughs and giggles. Something sinister is going on in Sorry-in-the-Vale, and it appears to be connected to the Lynburns, the town’s founding family. The tone of the book effortlessly shifts from light to chilling; it could be very creepy at times, yet without feeling like too much of a departure from the story’s droller moments. I am just in awe of how Sarah Rees Brennan weaved a dark, paranormal tale with hilarity. I absolutely adored Kami as a protagonist. She possesses a contagious vivacity; I’d love to have her as my best friend in real life. I also loved her journalistic aspirations, though her list of potential stories for the school newspaper that she started up, The Nosy Parker (love that name, too), would be more at home in a supermarket tabloid. Kami was such a delight to read about; she’s smart, funny, determined, and a ton of other adjectives that there isn’t enough room in this review to include. If Kami is my new fictional best friend, then Jared Lynburn is my new fictional boyfriend. He had me swooning even when he was only the voice in Kami’s head. Like Kami and just about every other character in this book, Jared has a knack for spouting witticisms. He’s also known a lot of pain in his life, and his source of comfort, through their mental connection, has been Kami. It is so, so awkward when Jared and Kami discover that the other is a real person. In a sense, they’ve known each other their entire lives, but at the same time, they don’t know each other at all. This is such an inventive concept, and the novel fully delivers on exploring both sides of sharing a bond like this. You have two young people who have been a part of one another’s lives for as long as they can remember. They’ve weathered tough times together, and yet they’ve never been able to experience being completely alone with their thoughts individually. This is quite different from your average conflict in a YA novel. And now I must speak of something that still pains me when I think about it: the ending. It is cruel. So very, very, very cruel. I believe my mouth was open in a silent scream afterwards; I was too stunned to make any sound. There should be a support group for readers who’ve finished this book; I know I needed one to help me cope with what happened. Needless to say, I am desperate for the sequel; the story just CANNOT stay like this! All in All: Despite how it ended, Unspoken was fantastic. I loved the original premise and how quirky the characters were. An ace read in every respect. "'Let me reference the mansion again,' Kami said. 'Put the jerk in the south wing, you won't see him for weeks at a time. Or lock him in the attic. The law will not be on your side, but literary precedent will.'" — "Chapter 3: The Secret in the Woods"
'That was their first mistake,' Jared said. 'They should've built a city on rock and roll.'" — "Chapter 7: You Are Not Safe"
"'Is this true Kami? Are you going out on a date?' Dad asked tragically. 'Wearing that? Wouldn't you fancy a shapeless cardigan instead? You rock a shapeless cardigan, honey.'" — "Chapter 15: Burning or Drowning"
I've read that this is going to be getting a mid-series cover change, with the forthcoming paperback of Unspoken getting a makeover that will match the hardcover of the next book in the series. Regardless of the cover, the book itself is absolutely amazing! Okay, so I read the "rant" before reading this review and now I am just scared to read this one. ;) The characters sound great though so it will be sticking on my TBR. It is absolutely worth reading. The ending killed me, but the book was so good that I couldn't deduct from the rating because of it. The writing in this book just suited me perfectly; it was the type of novel that I was meant to read. 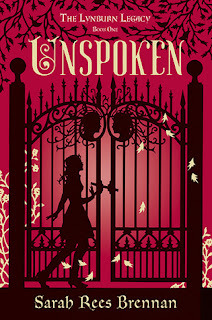 I hope you decide to give Unspoken a try! The humor in this book was just... fantastic. When I laughed (which I did for like 80% of the book) I was practically shaking! Jared and Kami. Words alone cannot describe my love for those two. Of course, that just made the ending all that more traumatic for me as a reader! I NEED THAT NEXT BOOK NOW. Lovely, lovely review as always! I'm so glad I found another blogger buddy who loved this book! PS: Have you been reading the Untold snippets that Sarah Rees Brennan has been posting each month? Because you should. And then we can fangirl together. I've never laughed so much while reading a book. I'm so happy to hear that you loved the humor, too! I don't think I'd even finished the first chapter when I realized that this book and I were sense of humor soul mates. I've read one Untold snippet, and GAH! It was brutal! I'm kind of afraid to check out the other ones, but I know I will anyway. I'm so happy you loved this one, Lee, and I am now VERY excited to read it too. I love it when books match my humor so perfectly (and I'm not really one to laugh while reading either. The few times I actually do, I will remember for a long time.) and even more when it's matched with some serious dark/creepiness. This was already on my TBR, but I definitely moved it up a lot :) Great review!! I can't wait to hear what you think of it, Judith! I LOVE books with dark overtones that also make me laugh, and this one was just PERFECT for me!